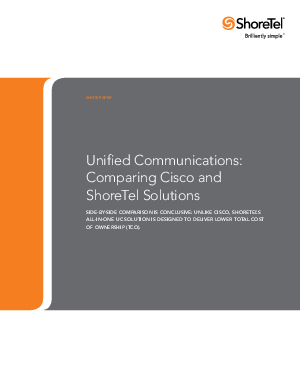 In a side-by-side comparison of these two solutions, this white paper demonstrates that organizations in need of comprehensive UC solutions can avoid Cisco product shortfalls. The flagship Cisco Unified Communications Manager (UCM) solution was assembled with technologies accumulated from several corporate acquisitions. The result is a complex solution that provides multiple user interfaces and requires extensive resources to manage. The ShoreTel UC system, by contrast, was designed to provide a single, all-in-one solution. Offering a seamless, integrated environment for users, and a unified, easily managed solution for IT administrators, the ShoreTel UC system integrates a full range of communications capabilities, including voice, video, instant messaging, and conferencing, plus advanced tools for mobility, presence detection, and collaboration. Compared with Cisco products, ShoreTel UC offers numerous advantages, including streamlined deployment and management, easier scalability, and a lower total cost of ownership (TCO). These factors enable businesses to capitalize on the benefits of unified communications without adding costs or complexity.